Sumiregaoka and Harajuku Children’s house All children are welcome, regardless of Japanese language ability. 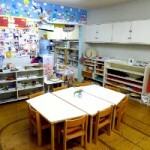 Montessori Kodomo no Ie, or children’s House, is one of the oldest and most highly respected Japanese Montessori school s in Tokyo. 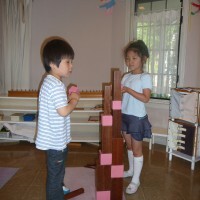 Founded nearly 40 years ago by current Director and Head teacher Kazuko Hotta, Children’s House had one of the city’s strongest reputations for classic Montessori education. 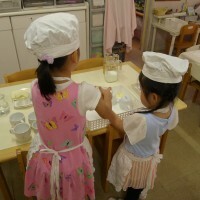 Children’s House provides complete Japanese immersion within a Montessori framework – a unique opportunity for children to work and play within an innovative Japanese educational environment. 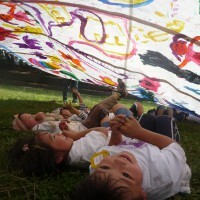 All children are welcome, regardless of Japanese ability. Based on the premise that children have and innate ability to learn, we trust child’s personality and respect their spontaneous activity. Prepared environment and educator guides through their development needs to reach their full potential. Classroom is not merely a place for individual learning. It is a vibrant community of children, where the child learns to interact in a variety of ways. The circumstance that 3-6 years old child are in the same class room enables the older children to teach the younger and learn much themselves from the experience while the younger children are inspired to more advanced work through observing the older ones. The three-year age range enables children to learn tolerance necessary for community work, patience, responsibility and grow minds caring each other. Freedom for children to engage in their own development according to their own particular developmental timeline. 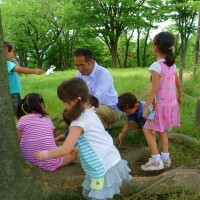 While repeated voluntary involvement with the environment, the child become active learners and are able to reach their own unique potential because they are learning their own pace and rhythm focusing their own particular development needs at that moment. Though that experience the child fosters the creative personality and respect the freedom of the individual. An environment that serves the particular needs of each child’s stage of development and interests. The child is able to access a variety of enticing Materials that based on Montessori philosophy and participate seasonal events and activities. That experience guides the child to enhance their intellectual ability, physical fitness, strong will and creativity. The 3-6 years old child is undergoing a process of self-construction. To fulfill their needs to balanced development, there are four main areas in the 3-6 years preschool program; Practical Life, Sensorial, Language and Mathematics. The practical life is the link of the child’s home environment and class room, which involves the child in precise movements which challenge them to concentrate to work that encourages the child to development their basic control of their own body and hands. Sensorial fields bring the child to the sense of the order and they actively seek to sort, arrange and classify their many experience; such as colors, sizes and forms. Sensorial experiences connect to Language and Mathematics world, which enables to the child obtain the way of looking at the world understanding measurable relationships inherit in our experience. Adding to the classroom activity, we sometimes go out to the outdoor activity such as camp, fruit picking and potato digging. Based on the daily activity records, we create a “Sodate-no-shirube (Growth record)” twice in one semester as a guide for the next childcare. Adding to it, summary of the entire development area and Work book which is full of child’s work are provided in the end of the year. Creativity will be brought up by spend every day thinking on your own. So that we day children of life itself is perhaps the creative art activities. Through Montessori education, the child who learned daily basic activities such as cut and paste, fold, draw and so on, enables to raise “sense of the art”, then they express artistic representation in the dynamic manner. In the class room, variety of natural materials such as wood, paper, cloth, tree nuts and clay, which the child are able to touch and feels. We have conducted the entrance briefing by the school director at several times in a month. After the end of childcare time (after 15:00), about 1-hour briefing provides how difference Montessori education and details of Sumiregaoka and Harajuku Children’s house (Briefing session is held by Japanese language). Please feel free to join us, we are able to answer your question. If you come with your child, our educator will take care of them. Please call by phone for further information. *Please refrain from calling during childcare hours (9:15-14:15). 2015 モンテッソーリすみれが丘子供の家　モンテッソーリ原宿子供の家 All rights reserved.